New Zealand is already world famous for it’s stunning landscapes, but conveniently for us these beautiful spots also provide the perfect climate for creating fantastic local wines. As the southernmost wine making region in the world, Central Otago winemakers have embraced the cooler climates to perfect their pinot noir, and many other varieties besides. Of course, you could enjoy a bottle of wine back at your motel but it’s even better on the best wine tour in Queenstown. Getting to meet the people behind the bottle, hear their stories and see the creation process for yourself is really something you can’t experience anywhere else. Whether you are in Queenstown to climb every mountain, throw yourself off a bungy jump or to raft down a river, we can’t think of a better way to kick back and reward yourself for your hard work (or insanity) than by letting us drive you around some of our favourite wineries and local spots to sample the best that Central Otago has to offer. Doing Queenstown’s best wine tour is also a fantastic way to reward yourself for being too sensible for any of these mad activities. And so you may ask, what does an Altitude Wine Tour actually involve? After picking you up from your door or a central Queenstown location in our luxury Mercedes vans you will not only meet your friendly guide and driver for the day, but also our on board digital host Lauren. Worried a the best wine tour in Queenstown would be too technical for you? Lauren will soon address any concerns you might have by sharing her local knowledge, as well as a few techniques for you to try at your tastings. Be as technical (or not) as you like – you will soon discover a technique that works for you! We find it is always best to start at the beginning, and so our first stop will be at The Gibbston Valley winery. As the very first winery in the region in the 1980s the owners were true pioneers and are proud to share the results of their hard work and experimentation with visitors. Learn everything you need to know about the region and what makes classic central Otago wine unique, before tasting several of their delicious wines in their ‘wine cave’. On the best wine tour in Queenstown, make sure you find time to visit the cheesery next door! We appreciate great food, not just great wine, and so after a more intimate tasting at another smaller winery we make sure you have the opportunity to indulge in a delicious lunch from one of our favourite local spots. With menus changing seasonally and options to suit all dietary requirements there is sure to be something to tempt you and to perfectly prepare you for the afternoon’s tastings. Naturally, we have chosen these spots not just for their amazing food, but for their spectacular locations and we hope you will love the views as much as we do. 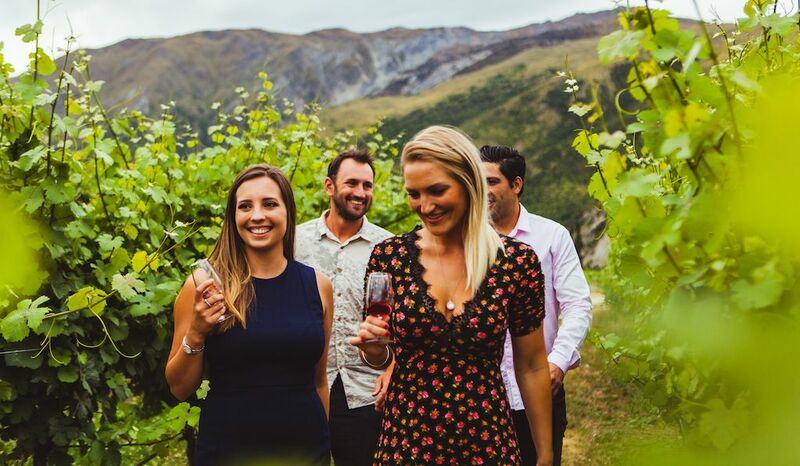 Altitude is proud of our great relationships with many boutique winemakers in the region, and are excited to take you off the beaten track on the best wine tour in Queenstown to visit two further wineries following lunch. Whether you are enjoying tastings with larger-than-life characters at Mount Rosa, or sat in the beautiful garden setting of Akarua we can guarantee delicious wines at a number of stunning locations, each of which will stand out for their own special reasons. As is always the way, all good things must come to an end, but on Queenstown’s best wine tour we can’t let you go without something to remember us by. You will find a gift waiting for you in our van before we return you to town, as well as plenty of safe storage for bottles of your favourites that you may have picked up throughout the day. If you are still picturing yourself in that beautiful setting with a glass of wine, we would love to hear from you. We not only share your vision, but are always excited to help others experience what we believe is not only Queenstown’s best wine tour, but the best wine tour in the world!